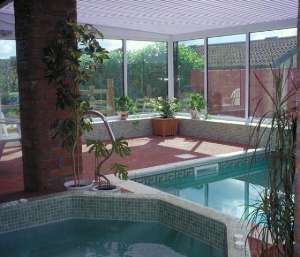 Mel House Cottages01751 475396work Self-cateringThe tastefully furnished and comfortable holiday properties at Mel House are situated within extensive level grounds with an indoor heated pool, spa and sauna available exclusively for guests. There are peaceful sitting-out areas with patio tables and chairs plus picnic benches, enclosed water garden with fish pond, barbecue and table tennis. Please note that we offer Short Breaks of less than 7 nights during our Winter Season only – roughly early November to mid-March – but excluding Christmas and New Year weeks. Mel House Cottages offers weekly bookings starting on Saturday and sometimes short breaks. Free Wi-Fi. This property is not regarded as suitable for younger children below aged 10 years. The published rental rates for this property assume occupation by 3 Guests. There is a supplemental charge for a 4th Guest which varies according to Season. Granary offers weekly bookings starting on Saturday and short breaks of 3 days starting on Friday and of 4 days starting on Monday in some seasons. Free Wi-Fi. Wood-burning Stove with free logs for winter warmth. Mallard offers weekly bookings starting on Saturday and sometimes short breaks.